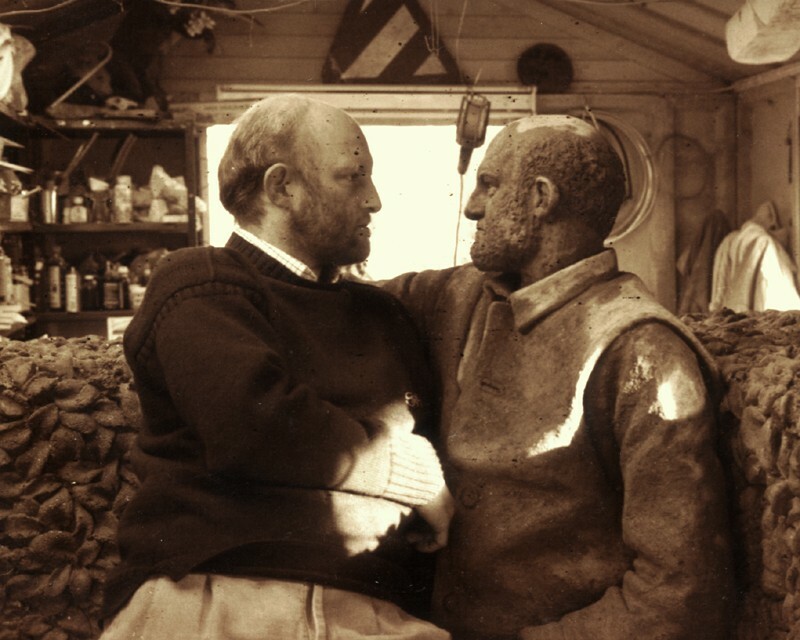 Made Of Stone: An Appreciation of the ‘Beeman’. I’ve busy right now with Oxjam , so haven’t had the chance to write much (well, not for here, anyway). 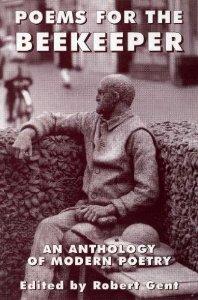 However, I recently decided to research a story on perhaps the most iconic piece of Beeston, the ‘Beeman’. Info on him was pretty hard to get hold of: the library had few resources and Wikipedia gave him but a passing mention, with no forwarding reference. Yet I eventually found a way to contact the sculptor, and sent off an email. I was very lucky to then get to speak behind the creative mind behind our favourite local legend. I will post up more pics that Sioban is sending over, and hopefully an interview with Steve Hodges ( who he? read on…). I’ve also amended Wikipedia, and talked to the library about setting up an archive: they’re keen. This article was initially intended only for The Beestonian, but space restrictions there would mean paring it down. There will be a feature in the November issue, but if you fancy a more in-depth look, then let me keep you no longer…. For 27 years, through blazing summers and frigid winters, he has sat, impassive. Daily, thousands pass, some stop, some give a quick glance and hurry by. He finds company in those tired as they shop, in the children that clamber over him, in the drunks who pose grinning by him, mugging delighted into a camera lens. Yet he sits, wistful, considering, exuding a quiet concrete calm as all life passes through, and round. Some call him ‘George’. ‘Isn’t he the sculptor’s father?’ one passer-by asks. Another makes much grander claims. ‘It’s in memory of a famous beekeeper, isn’t it? I remember hearing about him from my parents when young’. Few seem to know his true identity, or even a little about him. His real name is seldom used. 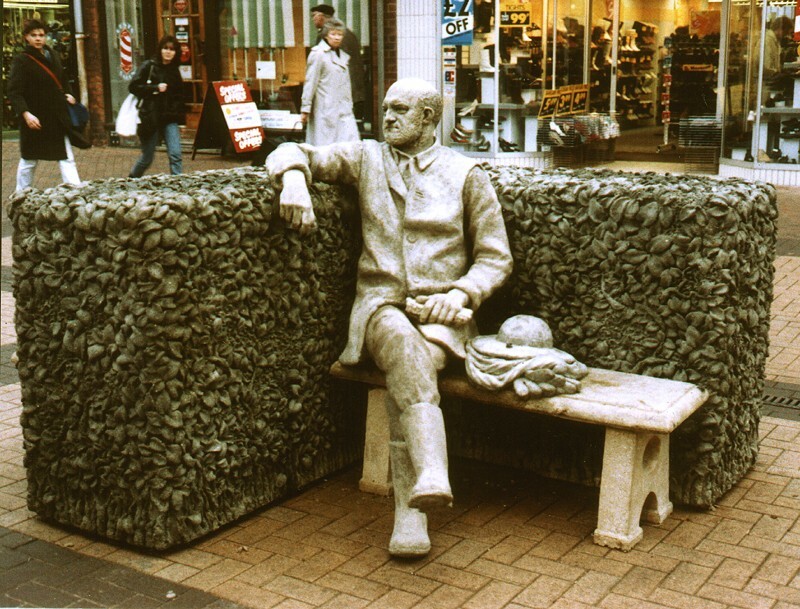 Although he is known in Beeston as ‘Beeman’, the true name is ‘The Beeston Seat’. While our petrified apiarist is indeed singled out for his own name by many, he is part of the whole sculpture. For such a prominent piece of civic life, it proves less than easy to find much about him. There is no plaque providing clues adorning the art, but a couple of inquiries to our well-informed civic and historical societies turns up a name: google does the rest. An email is sent requesting further info. Then I’m sitting with a pot of tea in the Flying Goose café on Chilwell Road, reading an anthology of poetry I’d earlier picked up at Nottingham Writer’s Studio; ‘Poems for the Beekeeper’. There are postcards of the Beeman for sale in the café, something I notice when my phone rings. It’s Sioban Coppinger, the sculptor behind the very same piece. Coincidence? Or testament to the Beeman’s ubiquity around town? 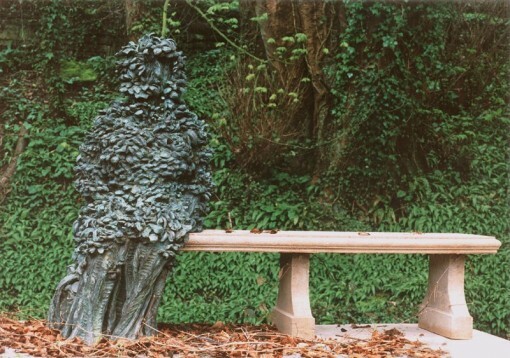 ‘The Sculptor’ Sioban Coppinger, 2002. How did the project come about? 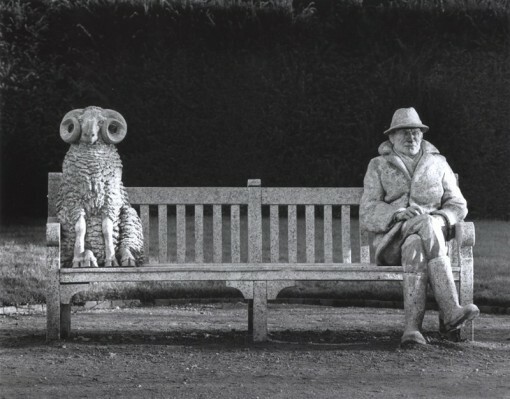 ‘Broxtowe Borough Council were looking for something to go along with the general renovation of the High Road in the eighties, and they’d seen my piece ‘Man and Ewe’ in Rufford Park, and thought something similar would be suitable. Beeston was quite down at heel at the time, and the council wanted a focus. The other public sculpture (Water Head, more famously known as ‘Stumpy’) had taken the prime spot in the Square so I had to think of how a piece would work on a street. Something to complement the geometric elements of the renovation, but with a sense of humanity to it. ‘I made several trips up to Beeston to look at the town, get a feel for it, see what defined it. I noticed the bee motif on the bins, and that set off my thinking. ‘I liked the pun of ‘bees’, although I was aware that Beeston isn’t about bees. I’m a fan of puns and it tied in with the idea of nature in an urban setting’. 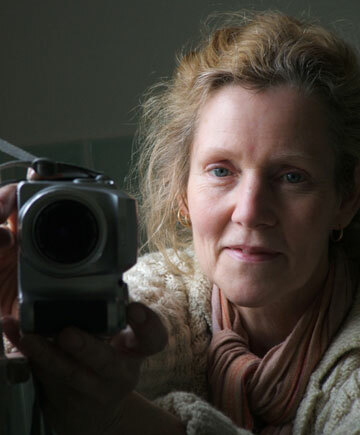 Yet a beekeeper wasn’t the original idea: ‘I had an idea: one I’d love to actually carry out someday, of a wall of hedge with a woman clipping a window to peer through’. But time spent in Beeston researching and sampling the unique ambience of the town, the more thoughts moved to the Beeman. ‘The best an artist can do is absorb agendas, try and represent the underlying happiness and sorrows of the environment, and represent this. My own positive nature comes through however; I think there is a warm, gentle nature to my pieces. ‘I wanted something that could be walked through, bypassed, sat on, interacted with, yet not detract from a person’s journey down the highroad. I’m of the firm belief that public art should engage, and if done correctly should become part of the place, not stand aside from it’. She hit upon the idea of creating a historical hero that didn’t exist: commemorating a beekeeper in a town whose links to bees has no history yet is synonymous with our flying honey-making fiends. This fond humour is also manifested in some touches you might not have noticed. ‘There are wrens hidden in the hedge; the idea is that young children will try and find them, and two hidden fish, to say ‘things don’t have to be the way you imagine’. 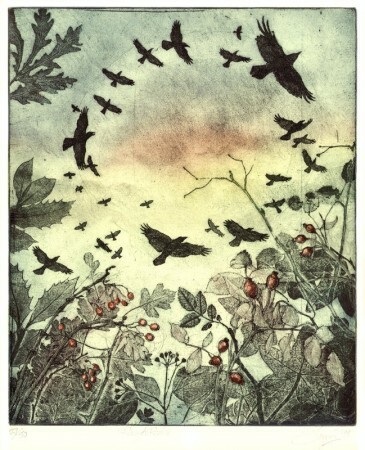 Ring of Rooks -Sioban Coppinger, 1998, etching. Sioban’s imagination is, as she freely admits, of a baroque nature: ‘With Beeston it was good to be told what limits I had to work in, or it could have been a never-ending project. To have restrictions allowed the ideas to condense’. Still, the Beeston Seat is baroque to an extent, joyfully packing a lot into a relatively small space. 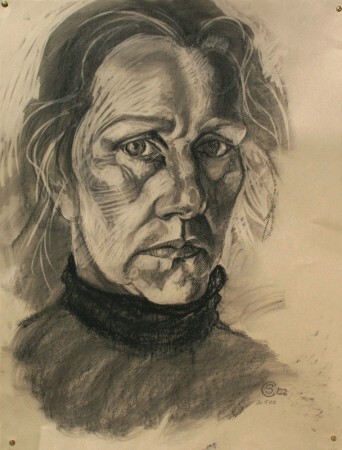 ‘I am a figurative artist, not a fashionable thing when I was studying in the seventies! I see sculpture as a form of street theatre, grab the publics attention, make them look in one direction’. Testament to the success of this is the way both Beestonians and visitors hold the piece with a certain fascination. I probably pass by several times a day, but always feel inclined to acknowledge his presence. Yes, ‘his’, for it never seems like just stone, it feels like a ‘he’, both hyper-real yet not real at all. Yet there is more here: the woman/ hedge hybrid has a quiet passivity, a knowledge as ancient and grounded as the plant she has become: she is someone you’d want to sit next to, an escape from the shrill rushing of everyday life. She embodies a sense of permanence, a reminder that our daily worries and concerns are temporal. The Beeman serves the same function: an island of quiet meditation in a sea of the hurried and the harried. While the out-stretched arm was a pragmatic decision for the piece, it works perfectly as an invite to come and sit beside. The practicalities of the piece were tough, however. The commission wanted the piece delivered in an extremely tight timescale, and many twenty-hour days of building up the piece followed before it was finally driven up on a low-loader to be put into place, in November 1987. ‘It was a cold, grim day. We parked up and several passers-by told us to ‘put it back on the lorry and take it away. Not the nicest reception. I had an assistant, and it took us a week to get the piece in place. I couldn’t afford to stay in Beeston so was driving back home to Newbury every night. The day after it had been opened (on 24th November, 1987), some of the same people who had given us such an unpleasant reception came over and apologised’. The model for the piece was long assumed, even by Wikipedia, as being Sioban’s father, called ‘George’. Not true. ‘It’s my friend Steven Hodges, a man who exudes the right air of calm. He came up for the official opening, and has been back since, posing for photos with his concrete form’ Is he bemused by his fame? ‘He takes it in his stride! He embodies the character perfectly though: gently acknowledging the celebrity status. He has that ability to sit there for decades, unflappable, absorb whatever surrounds him’. Steve Hodges meets his double….can you tell who is who? The Beeston Seat has become iconic over the years. He is a fond addition to the street, and one that once led to a rather extreme example of public engagement with art: ‘In the nineties, we were called up to repair elements of the statue after it had been vandalised. It was quite a job, and while Pete (her husband) and I were working we were approached by a gang of youths who explained how the damage had been caused. While they renovated the sculpture, residents assumed Sioban was a council worker. ‘I was decked out in blue overalls. My husband looks like Father Christmas, tall, big beard, so people assumed he was the artist, not me. They were therefore more candid, and that was great. I heard their opinions and thoughts on the piece in a way most artists would never have the luck to experience’. After 27 years of sitting in Beeston, a large chunk of the main piece – two benches that ran alongside the outer hedge – was stolen long ago, and some of the bronze bees have been prised off. The beeman’s nose is chipped off, giving him the rather incongruous appearance of having a pierced nose, and the metallic matrix that gives the piece it’s shape has worn through in some areas. Nevertheless it’s in surprisingly good shape. The Council did make a renovation of the Beeman a priority on its town maintenance agenda recently, and it seems that this is a legally binding obligation. The contract on the commission states that the council must keep the piece in good order, and if renovations are thus required, the original artist must be used to get the piece looking as good as new. As Beeston teeters on the edge of a new age, with the Square transformed, the tram running through and a surging spirit of civic pride rushing through the streets, what better way to mark this by getting our favourite adopted apiarist back into the pristine condition he deserves? After all, as Sioban explains: ‘You give people a focus, a nice environment, then they respond positively’. All photos Copyright of Sioban Coppinger. Article Copyright Matt Goold 2014. Super article, I am amazed he has been there for 27 years. It will be great to see him renovated. Everyone will be looking for the Wrens and fish now! I always wondered if the artist was the same person who did the one at Rufford Abbey, I have a photo of that with my children sitting inbetween the man and the ewe, lovely. Forgot to mention in my comments that the photo of the Statue and Steve who he’s modelled on is excellent. Ah! He’s a child of 1987 like me!